Most of the time shopping is hard. Finding the perfect pair of jeans or a sweater in the right color takes me months of agony. But, there was something about the brand Albus Lumen that was easy. From the moment I spotted the breezy dresses, linen tops, and vacation-worthy accessories, I could envision myself in every piece, and it turns out I'm not alone. My single roadblock in my quest to wear only Albus Lumen this summer: Retailers can't seem to keep it in stock. 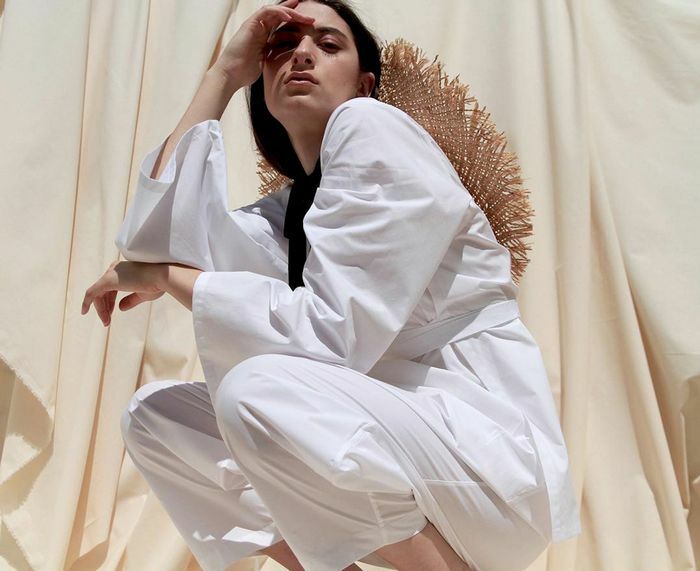 Translated from Latin, "Albus Lumen" means white light, a reference to the easy, earthy minimalism inhabited by the Australian brand. It's hard to think of a better description for the Australia-based brand, designed by Marina Afonina. Simple, flattering silhouettes are studded with nature-inspired details: a calico button, a shell earring. While there's no denying the continued power of maximalism and athleisure, I find that both myself and many of my peers crave something a bit lighter: pieces that translate from the office to evening, or from New York City to a vacation somewhere exotic. Albus Lumen squarely fits that void, offering pieces that feel sophisticated and easygoing all at once. Below, you'll see exactly what I mean. I've broken things down into the four reasons I'm convinced Albus Lumen will be the next big thing. A dress that befits a beach vacation can also double as a design for the office. Just imagine a sleek button-down underneath. This casual gown is perfect for dressing up or down. Available in UK sizes 6 to 8. Imagine summer days in this number. Perfect for a day out and about. Make it pop with pink. Stay on trend with these summery asymmetrical earrings. Block out those rays with this summer-perfect straw hat. This summer, bring the beach with you with these shell earrings. A reimagined blazer and a summery twist on a simple jumpsuit are the kinds of pieces that Albus Lumen has mastered. Ideal for strolling along the French Riviera (or just your neighborhood). Linen will be your go-to summer favorite. Available in UK sizes 12 to 14. Stay cool in this breezy top. I think that summer fashion can be stigmatized as being too playful or casual, but Albus Lumen proves this doesn't have to be the case. A romper can be sophisticated, and so can a crop top. Try a belted romper for the perfect day-out ensemble. This is how to do a summer crop top right. Available in UK sizes 6 to 10. When in doubt, go with a summer tunic. Now you're all set to give the brand a try.